"Julse Cambon" was build as "Mohawk" in 1913 by Howaldtswerke AG, Kiel for the Deutsch- Petroleum GmbH, Hamburg. 1914 sold to the Standard Shipping Co. of New Jersey, New York and renamed "Bayway". In 1925 sold to Soc. Auxilaire de Transports, Rouen, and renamed "Jules Cambon". 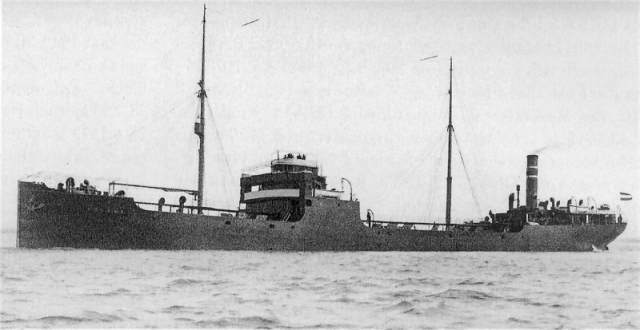 In 1930 sold to Leonhardt & Blumberg KRfPR, Hamburg and renamed "Lotte Leonhardt". From 1931 til 1933 laid up in Hamburg. In 1935 sold to Cia. Italiana Maritima, Venetie, and renamed "Todaro". In 1942 confiscated by the Italian Navy. Sunk in Bordeaux at 14.8.1944. 1946 salvaged and sold for breaking up. The Miramar Ship Index for "MOHAWK"
Scuttled at Bordeaux 14 Aug 1944, wreck removed by French salvors after WW II.